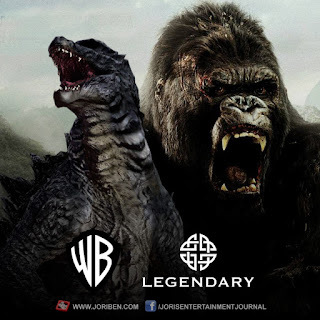 Warner Bros. Pictures together with Legendary Entertainment announces a film franchise that will star Godzilla, King of Kaijus and Kong, the Legendary Ape. KONG: SKULL ISLAND is confirmed for a 2017 release while GODZILLA 2 will follow in 2018. And lastly the most anticipated clash will happen with GODZILLA VS. KONG for 2020. Read Warner Bros. Official press release after the jump. The announcement that the reinvention of monsters continues was made today by Legendary CEO, Thomas Tull and Kevin Tsujihara, Chairman and CEO, Warner Bros. The initial trio of films are 2017’s KONG: SKULL ISLAND, GODZILLA 2 in 2018 and then GODZILLA VS. KONG, arriving in theaters in 2020. While Legendary maintains its new home at Universal Pictures, the GODZILLA films remain in partnership with Warner Bros., who will now also distribute KONG as a part of this franchise. Production on KONG: SKULL ISLAND begins October 19th. GODZILLA 2 will be written by Max Borenstein and directed by Gareth Edwards. Legendary is producing with Mary Parent and Alex Garcia will executive produce. The film is set to be released by Warner Bros. on June 8, 2018. Legendary Entertainment is a leading media company with film (Legendary Pictures), television and digital (Legendary Television and Digital Media) and comics (Legendary Comics) divisions dedicated to owning, producing and delivering content to mainstream audiences with a targeted focus on the powerful fandom demographic. Through complete or joint ownership, Legendary has built a library of marquee media properties and has established itself as a trusted brand which consistently delivers high-quality, commercial entertainment including some of the world’s most popular intellectual property. In aggregate, Legendary Pictures-associated productions have realized grosses of more than $12 billion worldwide at the box office. To learn more visit: www.legendary.com. Upcoming Legendary releases via its home at Universal Pictures include CRIMSON PEAK and KRAMPUS in 2015 and WARCRAFT in 2016. Warner Bros. Entertainment is a global leader in all forms of entertainment and their related businesses across all current and emerging media and platforms. A Time Warner Company, the fully integrated, broad-based studio is home to one of the most successful collections of brands in the world and stands at the forefront of every aspect of the entertainment industry from feature film, television and home entertainment production and worldwide distribution to DVD and Blu-ray, digital distribution, animation, comic books, video games, product and brand licensing, and broadcasting. Warner Bros. Pictures has been at the forefront of the motion picture industry since its inception and continues to be a leading creative force in the industry.